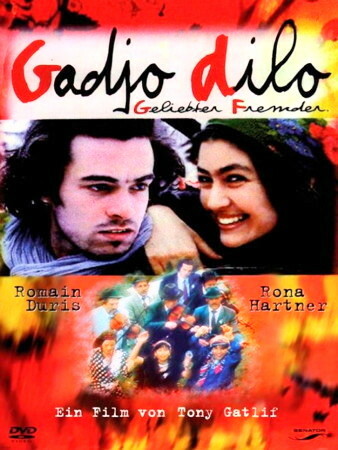 Information: Gadjo Dilo, a Romani film. The Romani peoples are so little understood that any depiction of them in the arts has unusual power to perpetuate myths, create new ones, or perhaps, even to dispel some of the fables and fantasies that still surround them. In the film, Director Tony Gatlif has navigated the seas of cultural conflict with great sensitivity and humour. Stéphane, the crazy stranger (Gadjo is the masculine of 'non Roma' so it means foreigner) does really crazy things like playing with children in the snow, cleaning Izidor's room, and continually asking for Nora Luca  the singer of his father's song. Cleaning the room can be seen as crazy on several levels. In Rom society, men and women have clearly defined roles. Cleaning rooms is very much the work of younger women, so his actions are incredibly funny, particularly to these younger women. It is also insulting to suggest that Isidor's room is not kept well enough. Looking for one singer is also strange when there is music all around you. Everybody sings and there are many good singers. Despite this craziness he manages to win the heart of Sabina. Sabina had been to Belgium with her husband to work as a dancer, but had not liked it (or him) and had returned to the village. Rom society is very closed when it comes to marriage. If you marry a gadjo/gadje you are out; no longer considered Roma. The fact that she is a divorcee, so somewhat "spoiled goods," makes it just believable that the village would accept a romance with a gadjo. Things turn sour when an accidental death provides the catalyst for the Romanians to destroy the Rom village. Unfortunately this is something that has been happening since the revolution ended Ceauscescu's dictatorship, with many Rom villages being torched. Director, Algerian born Tony Gatlif, has allowed the Rom to speak for themselves through their roles in the film. "People are afraid of the Rom who make fun of everything and are afraid of none. I wanted only non-professionals to play their proper roles in this film with Romain and Rona (Stéphane and Sabina). It is my most complete film, not in terms of the images, but in terms of sincerity. The poetic nature of the film is woven by life itself. When I arrived in Balteni, I found extraordinary people without a care for Romania nor France! Balteni is located 60 kilometres from Bucharest." Using real people in the film who say and do real things is a powerful technique. In "Time of the Romani," a film by Serbian director Emir Kusturica, Rom people also played themselves giving tremendous strength and veracity to the action. However, in that film the 'real' bits were interspersed with 'unreal', bizarre and often violent scenes. I found that juxtaposition exploitative and abusive. Furthermore, the credit for the music in 'Time of the Romani' was claimed by the musical director Bregovitch, despite all the tunes coming from the Romani repertoire. A day before the end of shooting, director Tony Gatlif still didn't know how the film was going to end. "I'm waiting for something, a sign that hasn't come. I don't want to end like in the movies. Do you understand? In my film, no one wins: neither Stéphane, the Romani, the Romanians, nor me or Romain Duris (the actor who plays Stéphane). I can feel we're going to come off badly." The ending he found has Stéphane destroying and burying his dat recordings, perhaps a rejection of his own exploitation of the Roma. Or perhaps he has accepted the Roma view that there is good music all around. The last word should belong to a friend who saw the film with me. At first she refused to believe that those people still live like that in this day and age, in such poverty, and then she became very cross because people might think that she, being from one of the Rom groups in Macedonia, could be the same as the Roma in the film! Most Roma live in houses, and wherever they have been allowed to, they have settled. This does not fit with 'the unfettered traveller' myth, one of the two favourite myths about 'Romani'. Similarly, the other favourite myth, that of "the petty thief" does not fit with Romanian police statistics which show that Roma commit less crime per capita than other ethnic groups. So when we use the word 'Rom', let's remember we are talking about real peoples, real cultures. Rob Bester has been learning and playing traditional dance music from around the Balkan region for many years. His band XENOS specializes in Roma music from Macedonia, and their drummer, Fuat Sazimanoski, is a Rom from the Egipchani of Ochrid, Macedonia.